Objective: Gnetum gnemon L. (melinjo) seed extract contained trans-resveratrol which has been shown to inhibit hydroxymethylglutaryl-CoA (HMG-CoA) reductase. Therefore it has a potent activity for lowering blood cholesterol. This study was carried out to determine the molecular dynamics simulation of HMG-CoA reductase inhibitors from Gnetum gnemon L. seed extract. Methods: Molecular dynamics simulation using AMBER was used. The simulation was set at 300 K as default temperature and 310 K, average human body temperature. The main parameters of this study were ligand-residue interaction, binding affinity, root mean square deviation (RMSD), root mean square fluctuation (RMSF), hydrogen bonds analysis, molecular mechanics Poisson Boltzmann surface area (MMPBSA), and molecular mechanics generalized born surface area (MMGBSA). 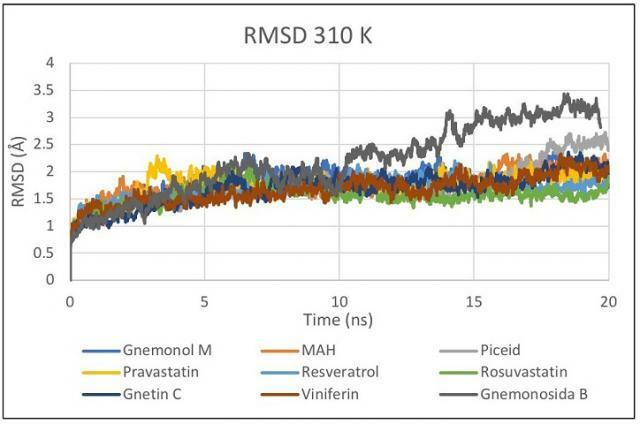 Results: In the simulation study, trans-resveratrol, trans-piceid, gnemonol M, gnemonoside B, viniferin and gnetin C had shown lower energy than HMG (PDB ID: MAH), the substrate of HMG-CoA Reductase. Free energy binding obtained from simulation was between 11.1 to -31.38 kcal/mol. Conclusion: The simulation at 310 K was preferable than 300 K as more interactions were performed and higher affinity was obtained. RMSD plot of residues on Microsoft Excel at 310 K during 20 ns. Artha Y, Arrahman A,, Yanuar A. Molecular Dynamic Simulation of Hydroxymethylglutaryl-CoA Reductase Inhibitors from Gnetum gnemon L. Seed Extract. Pharmacognosy Journal. 2018;10(4):793-797.